This soup will warm you to your soul. It's everything you want in a bowl of soup, comfort, warmth, and filling. It's getting cooler in many parts of the world. 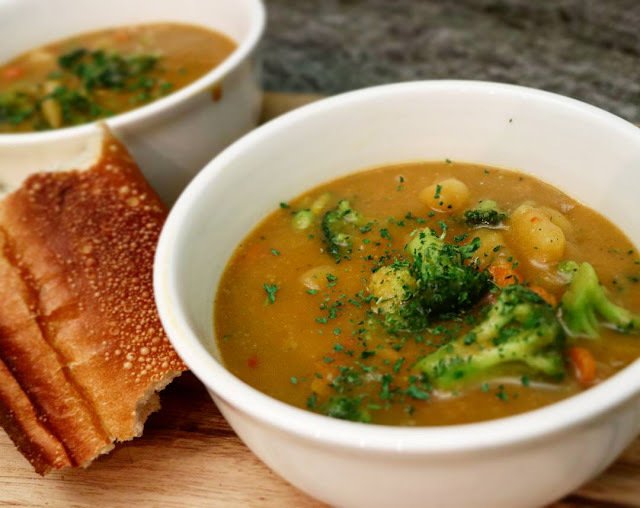 There's really nothing like coming home on crisp cool day to a big pot of hot comforting soup, that fills your belly and warms you straight to your soul. I wouldn't know anything about, that since its still 90°f here in Flordia, and don't even ask about the humidity. But, we don't care, we are craving soup just like a lot of people are this time of year. Soup is so nursing and just dang delicious! We've been enjoying this for dinner and the leftovers are even better. This recipe couldn't be any easier to throw together, here's what you'll need. 4-5 Medium Potatoes (I used Russet baking potatoes because I always have them on hand. If you are using a smaller potato you'll need more,). Heat a large pot on medium/high heat. Add diced onion, pepper, celery, carrots, add a little water just to get the party started and cook until the veggies have softened. Add chopped garlic and a little more water to prevent the garlic from burning. Add seasoning and continue to sautée until all the veggies are slightly browned about 5-7 minutes. Add the veggie stock and water bring to a boil, drop the heat a little and cook at a gentle boil for about 5 mins so the carrots can get a head start. Add potatoes cook until just tender. 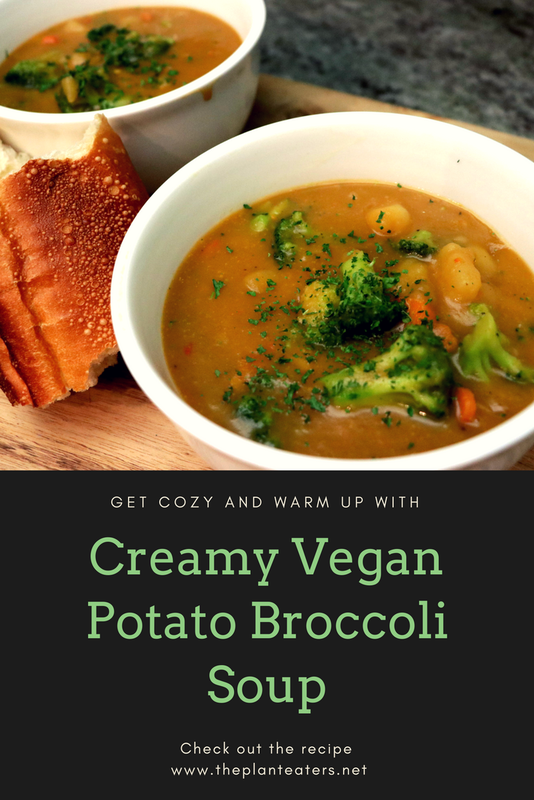 Once the potatoes are tender add 4-5 ladles of the potatoes and veggie to a high speed blender (try not you get too much liquid at this point, the amount of veggies in your pot is up to how chunky you like your soup. 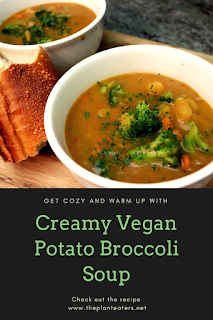 I like it pretty chunky so I make sure I have a good amount to potatoes and veggie left in the pot) add a couple of ladles of use the soup liquid to the blender. Add Nutritional yeast and 1 tsp of each of the spices your adding to your soup. Blend until super smooth and thick. 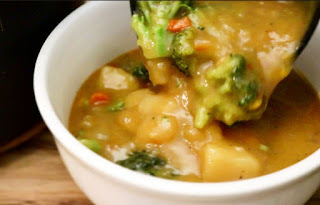 Add the blended soup back to the pot, stir and add broccoli and cook until tender. Please follow us on social media! I LOVE connecting with you all so much! Here's where you can find us, we are The Plant Eaters on all of them, or you can click the links and you'll find us! Watch the video so you can see step by step how I make it. This veggie stock has "natural flavoring" which means it could contain beef, seafood, or poultry. I had noticed that and was going to email the company to see if they could tell the source of the natural flavoring. :) I'll put it in the comments here if they get back with me. I'm so glad you guys brought this you. I called their customer service and asked if the natural flavoring was animal derived and they said no. Yay!! He confirmed no animal products in this product. Thanks again and much love~ Dad! Wow great recipe. Thanks for sharing useful and healthy recipe. I will definitely try this recipe. This looks like a great recipe! Thanks for sharing! Can this be made in a slow cooker?